TROY, NY – With the arrival of spring, Mayor Patrick Madden today announced season passes for the Frear Park Municipal Golf Course are available for purchase at the Pro Shop, 2701 Lavin Ct., Monday through Friday, 9:00am – 5:00pm, and Saturdays, 9:00am – 3:00pm. Troy residents qualify for daily discounts on greens fees with a Resident Recreational ID Card. Cards can be purchased at the Pro Shop for $25.00 with proof of residency (state-issued driver’s license, cable or telephone bill, etc.). Previously-issued resident ID cards are subject to annual renewal. Located within historic Frear Park, the Frear Park Golf Course is one of the crown jewels of the city’s recreational facilities. Originally designed as a nine-hole course which opened in 1931, the course was expanded to 18 holes in 1964, designed by Robert Trent Jones, one of the game’s greatest course architects. 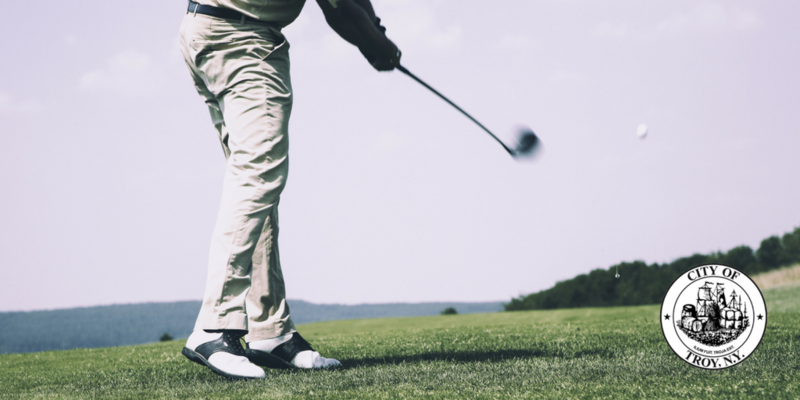 Enjoyed by thousands of players each year Frear Park remains a great attraction for local golfers, with twenty-seven established leagues and over 46,000 rounds of golf played annually. Additional information on Frear Park Golf Course’s 88th season, including opening day, will be announced at a later date. For more info, contact the Frear Park Pro Shop at (518) 270-4553, Parks & Recreation at (518) 235-7761, or visit the Parks & Recreation homepage.